Contemporary Photographers at Soho Photo Gallery is pleased to announce a lecture, free and open to the public, Amalie R. Rothschild: My Unexpected Career in Rock Music Photography, Thursday, Nov. 1, 2018 from 6 to 7:30pm. An award winning filmmaker and photographer, Rothschild studied with Harry Callahan at RISD and Paul Caponigro at NYU where she made her first film “Woo Who? May Wilson” about the “Grandma Moses of the Underground” for her MFA. It was shown at the 1970 New York Film Festival. She is noted for her documentaries about social issues as revealed through the lives of people in the arts, and for her photographs of seminal rock events, venues and musicians from 1968 to 1974. She was a member of the Joshua Light Show at the Fillmore East Theater in New York producing special effects photography, slides, graphics, films and film loops used during performances and was considered the theater’s unofficial house photographer. She had unlimited access onstage and backstage to all the happenings at the Fillmore East, and was on staff at the 1969 Woodstock Festival. During that period she photographed most of the major rock music events on the East Coast including the 1969 Newport Festival, Tanglewood 1969 & 1970, The Who’s U.S. premiere of their rock opera Tommy and the Rolling Stones at Madison Square Garden, Bob Dylan’s 1974 tour, and in England the 1969 Isle of Wight Festival, as well as anti-war/peace demonstrations in the U.S. during the 1960s and the 1967 Cannes Film Festival. 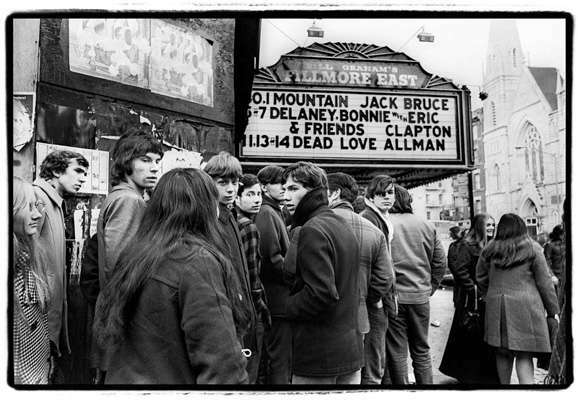 Her monograph “Live at the Fillmore East: A Photographic Memoir,” was published in 1999. She is represented by several galleries including Morrison Hotel in the U.S. and Snap Galleries in the U.K. While based in New York City since 1983, she lives and works more than half the year in Italy. In this talk she will discuss how being in the right place at the right time, and the accident of her documentary impulses, led her to record the birth of rock theater and how this created a 20,000 picture archive which has sustained her professionally into her 70s. In addition to showing many photographs she will also screen an excerpt of one of the very early 16mm music videos she shot during the same period.